If getting your loved ones to choke down a serving of vegetables is causing a nightly family feud, these recipes are for you. Are memories of frozen, microwaved, cheese-covered broccoli dishes preventing your family from opening their minds to this delicious green vegetable? Those days are long gone with the bounty of produce now available year-round. It’s high time to introduce them to broccoli served fresh and combined with big, bold flavors. These dishes just might turn those broccoli-haters into converts and you’ll be the proudest mama on the block! 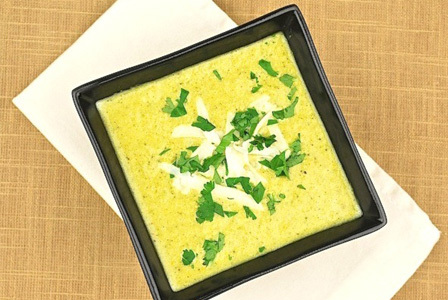 Taking the extra step of roasting the broccoli gives this soup more depth and the combination of curry and cilantro can’t be beat. Roughly chop broccoli and bell pepper. Place on a rimmed baking sheet, toss with two tablespoons olive oil and generously season with salt and pepper. Roast for about 20 minutes, flipping occasionally until soft. Heat remaining two tablespoons of olive oil in a large pot. Sauté onions until they are just starting to brown, and then add garlic and ginger and cook for another minute. Stir roasted broccoli and peppers to the onion mixture and add chicken broth and curry powders. Bring to a boil, and then reduce to a simmer and cover. Let simmer for about 10 minutes. Using a blender or immersion blender, puree soup until smooth. Stir in grated cheese and add salt and pepper as needed. To serve, top each bowl with about a tablespoon of chopped cilantro. Broccoli salad can be boring, but adding a tangy vinaigrette, nuts and fresh cheese gives this dish a ton of extra pizzazz. Whisk together 1/4 cup olive oil, red wine vinegar, Dijon mustard, salt and pepper. Reserve. Steam broccoli over boiling water to desired tenderness, about five to seven minutes. Meanwhile, heat one tablespoon of olive oil in a large pan over medium heat. Sauté shallots and red pepper flakes until shallots are soft. Add garlic and sliced mini sweet peppers. Cook until peppers are just starting to soften. Add steamed broccoli to pan and toss well to combine. Cook for another minute, and then transfer to a large bowl. Immediately pour about half the vinaigrette over the broccoli, stirring lightly to combine. Let sit for about five minutes, and then add more vinaigrette as needed. Fold in mozzarella and almonds just before serving.